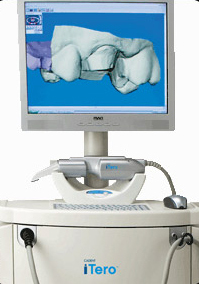 Dr. Cothern is one of the few doctors in our area who uses the iTero system for dental impressions. For certain types of dental restorations, you can avoid having to get a traditional (and sometimes uncomfortable and messy) dental impression of your teeth. iTero™ technology allows Dr. Cothern to take a digital, three-dimensional impression of your teeth that can be used in crafting customized porcelain restorations, such as crowns, veneers and bridges. The procedure is fast, comfortable, and extremely accurate and it leads to superior results for your dental treatment.